Lunch is an opportunity to develop good eating habits. In keeping with balanced nutritional practices, the children will be served a healthy hot lunch provided by a professional caterer. A variety of foods will be presented, giving the children many opportunities to taste different foods and broaden their appetite to include many healthy nutritional selections. The American Academy of Pediatrics recommends 6 ounces or less of juice per day; therefore Montessori Pathways School provides milk and filtered water for the children. Please advise the office of any food allergies your child has. Lunchtime is also a social time in which we practice grace and courtesy. There is a routine to lunch. Each child has a plate, silverware, and glass at a table. 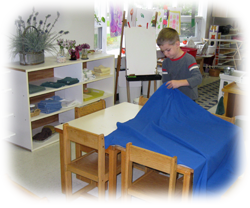 We use cloth tablecloths and napkins for a more pleasant atmosphere. Often fresh flowers decorate our tables. We wait to begin eating until each child at the table is ready. We then recite our group poem or sing our community song. The colorful tablecloths, music and fresh flowers create a calm atmosphere for the social experience of eating together and enjoying each other’s company and conversation. The school provides a hot lunch for each child. 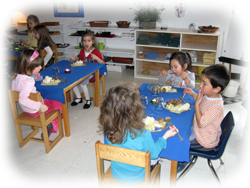 Eating family style in small groups promotes community and conversation. Therefore, DO NOT send individual lunches. Only children with dietary or religious restrictions can bring their own food. We do not serve pork products.